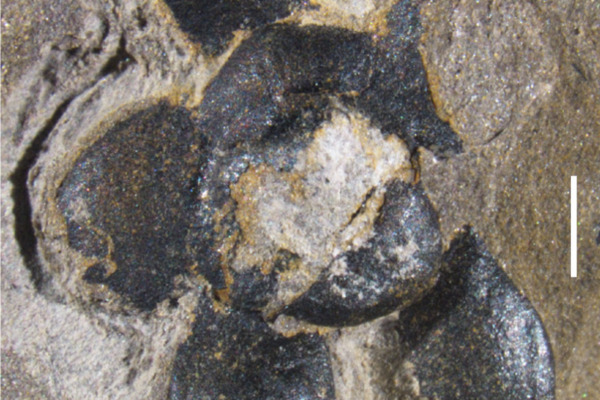 Textbooks tell us that the first flowers appeared about 125 Million years ago. But, in a recent paper published in eLife, Qiang Fu and his colleagues from the Nanjing Institute of Geology and Palaeontology have now discovered fossilised flowers, which they have named Nanjinganthus after the place where the fossils were found, that date from 175 Million years ago, placing them in the early Jurassic. "The textbooks teach no flowers in the Jurassic, which means we have been misunderstanding the history of flowers and angiosperms [plants whose reproductive organs are found in flowers]," says Wang. The fossils, found in the Nanjing region in China, comprise over 200 specimens. “The huge number of specimens gave us a chance to observe the flower from different angles,” explains Wang. Combining information from these specimens allowed reliable reconstruction of a single flower. The ovary sits in a cup shaped receptacle – the part of the flower which connects to the stem – and is closed off by an ovarian roof. Ovule protection inside the ovary, as evidenced by the lack of sediment, sets Nanjinganthus apart from gymnosperms, the angiosperms’ closest relatives, whose seeds are unprotected. Nanjinganthus is further set apart from known species by its star-shaped symmetry, and a branched style, the tube-like structure connecting the ovary and the pistil on which the pollen lands for fertilization – associated with wind pollination. Nanjinganthus challenges the textbook conception of the first flower as having female reproductive structures that are not joined together, no ovarian roof and no obvious style, as well as the association of cup-shaped receptacles with more recently evolved species. The inconsistency between theory and the fossil record calls into question the way we understand early angiosperm evolution. The team offers multiple explanations for this discrepancy. It may be that the first flowers bloomed earlier than Nanjinganthus gave rise to two groups, one resembling Nanjinganthus and the other closer to our previous conception of the first angiosperms. It may also be that different structures reflect multiple origins of the flower. In general, these may suggest that examining species alive today only provides limited insights into early evolution and ancestral structures. Studying flower evolution matters because one sixth of known living species are angiosperms. Their great diversity means understanding their evolution can provide great insights into evolutionary patterns. Their close interactions with pollinators can also inform our view of ecological context and natural history. Beyond intellectual curiosity, much of our food depends on flowering plants, and a better understanding of flower biology can help maximize fruit and grain amount and quality. These new fossils thus revive the important question of flower origins.